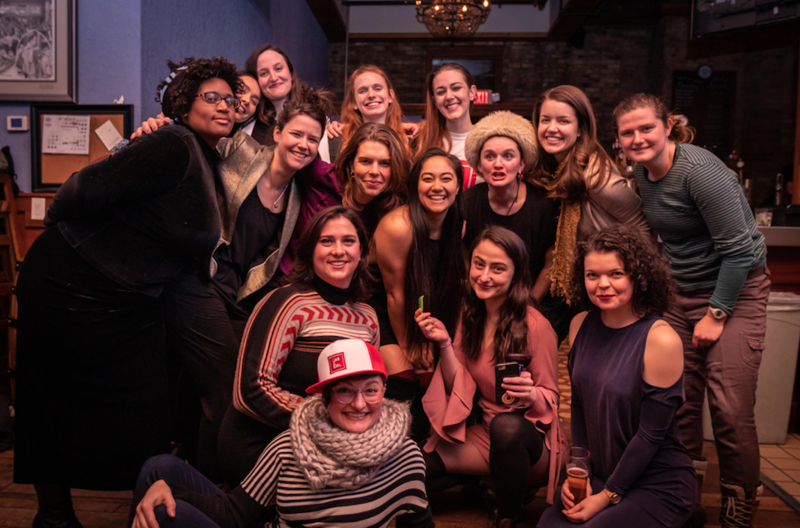 Sarah Rasmussen is the artistic director at Minneapolis’s Jungle Theater, and Joanie Schultz is the former artistic director at Addison’s WaterTower Theatre. Want to see the rest of the interview? Sarah Rasmussen: What are you most proud of in the last couple of years, as you transitioned into and out of the artistic director role at WaterTower Theatre in Addison, Texas? Joanie Schultz: So many things. I look back at WaterTower and I’m so proud of every show we did. Of every initiative we started. Of the way we were creating some real change, which had a ripple effect into the community. But the season we just finished, which was the only one I will have gotten to actually program and see out—I just loved it. We achieved our ticket sales goals and we were able to do something different. My goal when I came in was to work off the old model of WaterTower but see it in a different way. We did Kate Hamill’s Pride and Prejudice, which I loved because how do you find a feminist farce anywhere? We created a new devised holiday piece that was incredibly moving. We did Quiara Alegría Hudes’ Elliot, A Soldier’s Fugue, which had our first completely Latinx cast. Then we developed and produced a new play by Regina Taylor, Bread, which was about an African American family in Dallas, which was really meaningful to the community. We then did an inventive production of The Last Five Years, and an immersive production of Hand to God by Robert Askins. All of the productions were unique to our theatre, establishing an inclusive and innovative new take on the work the theatre had historically done. The staff worked incredibly hard, and I think we did a good job of supporting artists. We also did a new play festival and I started a community engagement program called Intersections. Intersections is an initiative I’m incredibly proud of. And I hope it continues because it was just really at the beginning. In organizations of our size, we have to start something in order to then get funding for it. 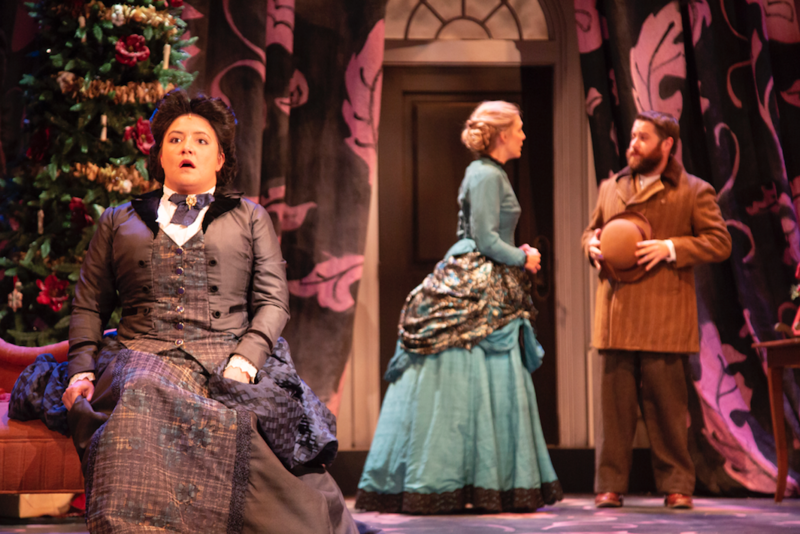 A Doll's House at WaterTower Theatre, adapted and directed by Joanie Schultz. Photo by Jason Anderson. Sarah: And then figure out how to staff it in a way that’s sustainable, so we don’t just start things that then tap everyone out to the point that we can’t continue what we already were doing. Joanie: Sometimes it’s just about piloting something, and if we can’t get any funding for it in the next year, then we have to let it go. What are you most proud of in recent years, as you took the helm as the artistic director at the Jungle Theater in Minneapolis? It’s required a deep bandwidth in terms of mentorship and capacity, because the last thing I want to do is take an artist I love and say, “I’m going to give you this chance, but...” If they’re not supported, that can have a really negative impact on their career. But it’s worked beautifully. I’m proud that a number of women in this town are getting bigger opportunities as a result. Before I got to the Jungle, only two women had directed there in twenty-five years. So it was long overdue. We’ve also started to tell very different kinds of stories, shifting the conversation to new plays, to work that’s structured differently or is pushing boundaries in various ways. I‘m excited to keep expanding audience engagement. I’m really excited about intergenerational collaborations and conversations. How do we deepen the conversation with artists and audience about the work itself? It takes time. That’s been a big learning for me, that it doesn’t happen overnight. It’s been humbling to realize I can say whatever I want, I can say this is what we value, I can say this is what’s important, but if my audience doesn’t viscerally feel that, it’s not fully connecting. So how do I connect more deeply? How do I challenge them, but also embrace them and keep getting to know them? It’s been humbling to realize I can say whatever I want, I can say this is what we value, I can say this is what’s important, but if my audience doesn’t viscerally feel that, it’s not fully connecting. Joanie: Embrace and get to know them, but also remembering that our jobs are not to just give them what we think they want. That would kill us. It’s about asking: What’s the conversation I’m really having with the audience? And also: How am I expanding my audience too? We want to bring people into our theatre who have never before, because we weren’t telling their stories. Sarah: If we don’t take those really big risks, we can’t be surprised. Perhaps because I was new to artistic leadership, I moved my audience really fast, and for a lot of people it was too fast. We certainly saw some drop-off and frustration right away. In retrospect, I think that was the right move. It got us further faster. But it’s scary along the way. Joanie: Do you think some folks were maybe frustrated at first but came around? Sarah: Yes, some people had to see critical and peer enthusiasm first. But a fair amount of people were done, it just wasn’t for them. And that hurt. I tried to be respectful, because I also really value much of the Jungle’s past. But if the new vision isn’t for you, I completely understand. It took a while, but three years in we are gaining new subscribers. Playing to over 93 percent capacity the last couple seasons has incentivized subscribing. New people filled in where other people left. The white-knuckling part of it for a while was: Are we going to be able to fill the gap? I don’t think our audience thought they wanted new work. When I applied for the job, the board was actually fairly skittish about new work. I can see where they were coming from in assuming the audience wanted what they’d been seeing. Opening night of The Wolves remount. Photo by Martin Rittenberry. Interestingly enough, the things that we’ve done that are bolder in terms of new work or aesthetic have been the most critically and financially successful. We’re remounting The Wolves this year because we ran these really long waitlists when we produced it the first time. It delights me but it also surprises me, because The Wolves is aesthetically— and in terms or representation—180 degrees from what the theatre had been producing. And yet that’s the thing we had the most demand for. I wouldn’t have learned that had we not taken that leap. And now that I know that, how do I use that? Joanie: I don’t think anybody has research on this, I was looking for it: numbers on this attrition of subscribers with leadership change. But anecdotally, when I talk to other people, I hear tons of these stories. Even with new artistic directors who are very in line with their predecessor, there’s still attrition. Because we are all different human beings. So even when we’re interpreting the exact same ideas that the former leader had, they’re still going to come out differently. There are still going to be people who perceive them as different, even if they’re very similar, and then decide it’s not for them. Sarah: The funniest and darkest advice I got when I took the job at the Jungle came from an artistic director, a mentor: “Get ready, because you’re not only going to be compared to someone’s favorite show in the past twenty-five years, you’re going to be compared to their memory of their favorite show.” That hit me in such a visceral way. You’re not comparing this holiday to your favorite holiday. You’re comparing it to your childhood memory of the holiday. That is real. In Bill Rauch and Diane Ragsdale’s conversation about leadership changes on HowlRound, Bill used the word change a lot. Like, what’s going to change? That word was so exciting to him, and it was thrilling to others. But for some people it struck feelings of inadequacy or that the past had been bad. I’m so glad Bill told me that when I took this job. In no way do I want to throw the past under the bus. This theatre has a beautiful legacy. But we can’t be the same as our predecessors. I’m curious about overlap with predecessors and staff. What was your experience? Joanie: That’s a complicated question, and it’s probably a little different for everybody. In my situation, the former producing artistic director was gone for six months before I arrived. I wish he’d been around a little to help transition the community. Sarah: I love what David said in his article: that it’s really important to set the new leader up, and for the board to speak with one voice about them. And that if you’re not on board with it, gracefully go. I didn’t have much overlap with the artistic director either. That gave me space to get going and make the job my own. But I needed a faster and more robust introduction to donors, to the community. This is not a criticism on my board, I just wish I would have known that and asked for that. Being too studied or careful isn’t right. At the end of the day, artistic choices need to come from that truly creative place of taking leaps. Joanie: Me too. I wish I would have had a faster and more comprehensive introduction. It was a complicated time because I had directing projects I had to finish and I was in and out of town for the first six months. Sarah: How do you learn those very particular, idiosyncratic things about a community? Things they may not even be able to articulate themselves. Do you just learn them the hard way? Joanie: It just takes time. On a personal level, I had never lived anywhere but Chicago, and I was coming into a really specific community. But I think that’s part of being a new artistic director in a new community. You’re just not going to know. But also, when I look back, some of my stumbling blocks and some of the moments where I now see, “Wow, what I did there was radical for that community,” I’m kind of glad I didn’t know I was being that bold. It gave me some freedom. Sarah: Agreed. I think sometimes being too studied or careful isn’t right. At the end of the day, artistic choices need to come from that truly creative place of taking leaps. We’re trying to take people to a place they’ve never been before. And I feel very protective of that, of the mystery around that. Joanie: It’s like in A Director Prepares, Anne Bogart says, “Do your homework and know when to stop doing your homework.” I think that’s what that looks like for an artistic director. Sarah: Do you feel like when you stepped into your role at WaterTower that people were able to treat you as a completely new and different leader? Or do you think that cultures default to treating a new leader the way they interacted with a former one? Joanie: There was definitely a lot of retraining of people in that way. I think my predecessor and I had very different styles of leadership. Sarah: I’ve learned founder-led boards have to reset their relationship to a new leader. A huge surprise for me was realizing so much the initial reaction I got from board, staff, even audience wasn’t about me. They were so used to the former leader, and were defaulting to treating me they way they interacted with him. It was really incumbent upon me to set the parameters of how we were going to move forward. I took over for somebody who was decades older than me. A single man. And I’m a woman with two small children, who has different strengths and weaknesses and a completely different life. I had worked in a lot in different places—organizations that have experienced more change. It was a lot of heavy lifting to be in a place that hadn’t experienced change. It was really hard to be new, learning and simultaneously facilitating big culture changes. Joanie: It’s a really interesting relationship, in particular with the board of a founder-led company because the board hires you to lead them. They didn’t hire the previous person, they were chosen by that person. Sarah: What you’re saying is huge. Joanie: It’s a very different relationship when they are the people who hired you. Sarah: It turns everything on its head in terms of how that collaboration is going to change. And those boards haven’t experienced change. Even with the best intentions, they haven’t been through this. And when it’s a board that hasn’t been through it, and a new artistic director who hasn’t been through it, everyone is headed into uncharted territory. Joanie: And even when you get excited about change, you also have to make sure you’re looking at the scary parts of it the whole time. Sarah: I’m still coming to terms with the fact that I don’t know everything. And that’s okay. I want to know more, and because of how things have gone down, I’ve gotten a crash course. But along the way I’d sometimes feel it was all on fire, or that I had to know everything. Feeling confident—and, frankly, entitled enough to say, “I don’t know this” or “I need help on this” or “I need more support here” has been huge because there is so much expectation with a new leader. I don’t think it’s intentional, but I think it’s too much weight sometimes. As we know, when something goes well it’s cause a lot of people contributed to it. And when something goes badly, it’s because of multiple forces. But I do think it’s tricky as artistic directors to not feel like it is all on us all the time. Joanie: This is why we have the triumvirate: the artistic director, the managing director, and the board. It’s like that for a reason. Sarah: I guess what I’m saying is that I’ve been here for over three years. And it’s just now that I’m starting to feel okay, to feel stable. And that that isn’t unusual. I didn’t know that coming in. The US and Canada are in the middle of an unprecedented turnover of artistic leadership in the nonprofit theatre. This series aims to put a range of voices, issues, and ideas in play that can inform and reflect this historic changeover.